Barcelona’s Museum of Contemporary Art is known to push boundaries. In this futuristic building, you’ll find some of the most avant-garde and thought-provoking pieces of art in Europe. So where does gastronomy come in? Step into the MIRALDA MADEINUSA exhibit. The exhibit brings together all of the fourteen projects made by Miralda in the United States from the mid-seventies to the late nineties. 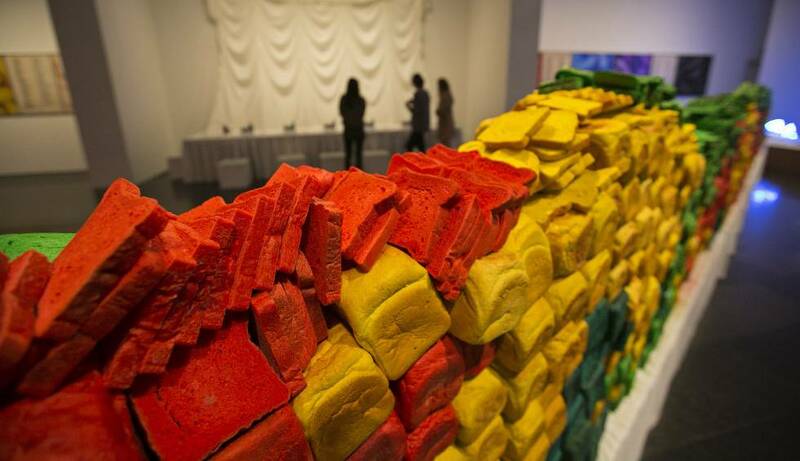 Among them, you can find an exhibit called Breadline; a warehouse-sized line of colored bread loaves, arranged neatly across the room. To the side, you’ll find a projection of women walking down a runway, and a man measuring their waist size: a quintessential scene from a 1950’s beauty pageant, juxtaposed with a gargantuan display of carbs. Wheat & Steak (1981), a food parade along the streets of Kansas City; El Internacional Tapas Bar & Restaurant(1984–86), a social and artistic experiment made with the restauranteur Montse Guillén in New York’s TriBeCa. The exhibition will also include the large installation belonging to the MACBA Collection, Santa Comida (Holy Food), 1984–89, based on the legacy of Afro-Caribbean culture in America today. Just outside you’ll find a dinner table. And on each plate, there’s a different country’s flag recreated out of food. Perhaps the thought-provoking part of this piece is that each perishable flag has begun to grow mold. Gastronomy meets modern art, and the results — while not appetizing — offer a new perspective on body image, sustainability, and privilege. Just some food for thought. The Exhibit is open until April 2017. Every Friday from 5 pm to closing, you can contribute 3 euros and enjoy a cocktail and tapas from El Internacional Tapas Bar.